Kaitlyn Tang (second from left) with her parents Ben and Judy, sister Nicole, and grandfather Kanji Sahara. 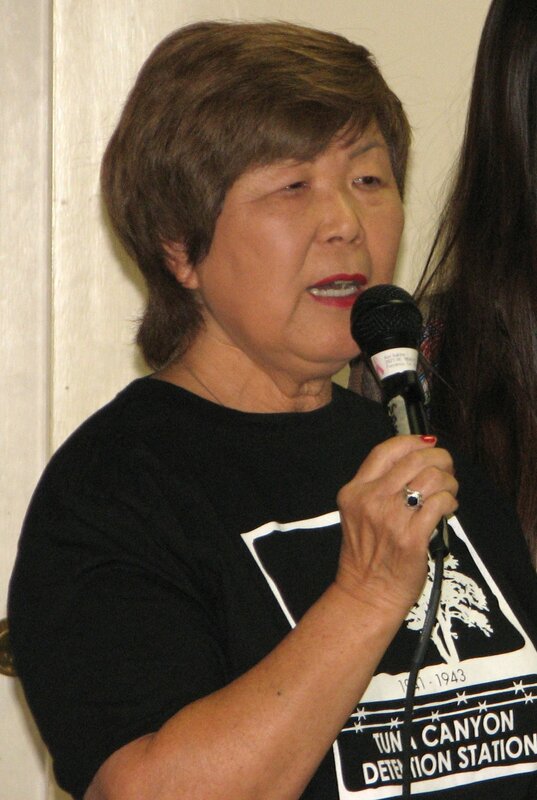 GARDENA — The Greater L.A. Chapter of the JACL presented a talk on the Tuna Canyon Detention Station on Jan. 17 at the Merit Park Recreation Hall in Gardena. 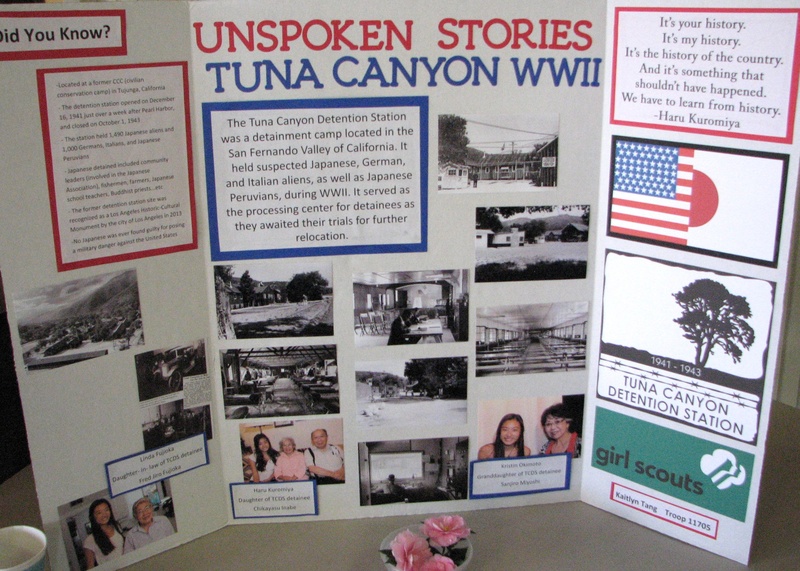 The main speaker was Kaitlyn Tang of Girl Scout Troop 11705, who did a project on Tuna Canyon for her Gold Award. Nancy Oda of the Tuna Canyon Detention Station Coalition. The interviewees were Linda Fujioka, daughter-in-law of Fred Jiro Fujioka; Haru Kuromiya, daughter of Chikayasu Inabe; and Kristin Okimoto, granddaughter of Sanjiro Miyoshi. 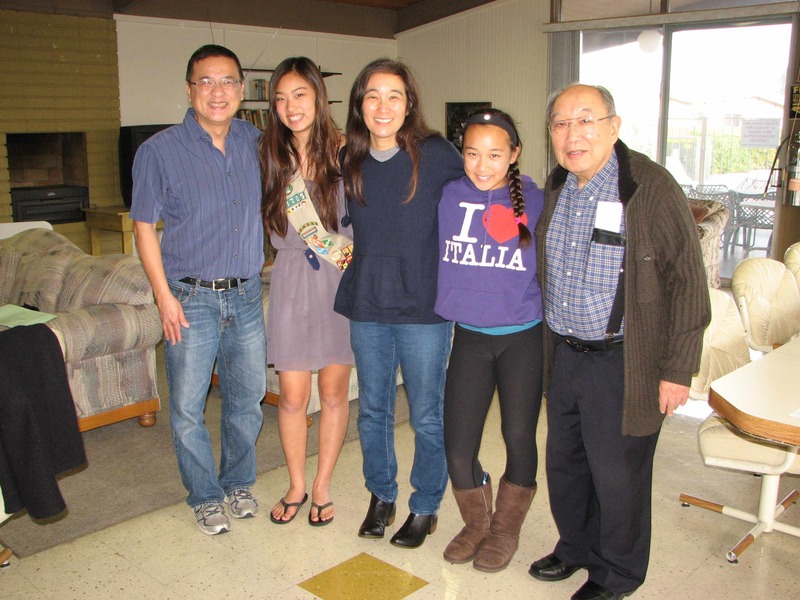 Tang’s grandfather, chapter member Kanji Sahara, helped her record the interviews. A video was shown, with Tang’s father Ben assisting with the projector and Nancy Takayama of Pacific Southwest District JACL providing the screen. As part of her work to qualify for the Gold Awrd, Tang is scheduled to do her presentation at Vista Grande Elementary School in Rancho Palos Verdes and at Girl Scout meetings in Los Angeles. The detainees were sent to confinement sites further inland, such as the Justice Department camp in Crystal City, Texas and the War Relocation Authority camps, such as Manzanar. The detention station was converted into a reform school for boys and was later razed to make way for the Verdugo Hills Golf Course. A display that Kaitlyn Tang created for her Gold Award project. Nancy Oda, president of the Tuna Canyon Detention Station Coalition (www.tunacanyon.org), gave an update on the group’s traveling exhibit, which is sponsored by a Japanese American Confinement Sites (JACS) grant from the National Park Service. The exhibit is expected to open in the fall. Oda focused on developing a sense of place and the people who were detained. The diaries of Rev. Daisho Tana and Sasabune Sasaki revealed much about the raw emotion and the democratic environment created by Merrill Scott, the officer in charge, and the ability of the Issei to endure imprisonment, she said. The coalition’s goal is to establish a monument at the camp site. As none of the buildings remain, the proposed location is a grove of oak trees that dates back to World War II. The coalition has confirmed the names of 2,000 detainees for an honor wall. The Los Angeles City Council declared Tuna Canyon as Cultural-Historic Monument 1039 in 2013. The owner of the property, Snowball West Investments, has sued the city, arguing that monument status will place too many restrictions on development. The suit is still pending. The coalition is concerned that the proposed monument site could end up inside a gated community. A question-and-answer session followed the talks. Chapter board members brought an Oshogatsu lunch for everyone. The presentations were preceded by a chapter meeting in which Janet Okubo was installed as president by Michelle Yamashiro, JACL Pacific Southwest District governor.